MacroGenics will partner with NanoString Technologies to identify and develop potential biomarkers for MacroGenics’ immuno-oncology candidate MGD013, the companies said today, through a collaboration whose value was not disclosed. MacroGenics and NanoString said they will carry out joint research using NanoString’s PanCancer IO 360 Panel to explore potentially predictive signatures for clinical applications of MGD013. PanCancer IPO 360 is a 770-gene research-use-only expression panel that is designed to facilitate a multifaceted characterization of disease biology and interrogation of mechanisms of immune evasion. Developed for translational research, the panel incorporates 47 potentially predictive Research-Use-Only biological signatures—including Tumor Inflammation Signature (TIS), 18 functional genes known to be associated with response to PD-1/PD-L1 inhibitors pathway blockade, as identified in a 2017 study. TIS is designed to measure the presence or absence of a peripherally suppressed adaptive immune response, activity that according to MacroGenics and NanoString is relevant to the mechanism of action of MGD013. Should the companies identify a predictive biomarker, they may develop a companion diagnostic for specific clinical applications of MGD013, MacroGenics and NanoString said. MGD013 is an IgG4κ bispecific Dual-Affinity Re-Targeting (DART) molecule designed to simultaneously block the PD-1 and LAG-3 pathways. MacroGenics reasons that disrupting these pathways may further restore exhausted T-cell function and enhance anti-tumor efficacy. MGD013 is now in the dose escalation portion of a Phase I/II trial (NCT03219268), designed to study the tolerability and preliminary safety of the treatment candidate in advanced solid tumors and hematologic malignancies. 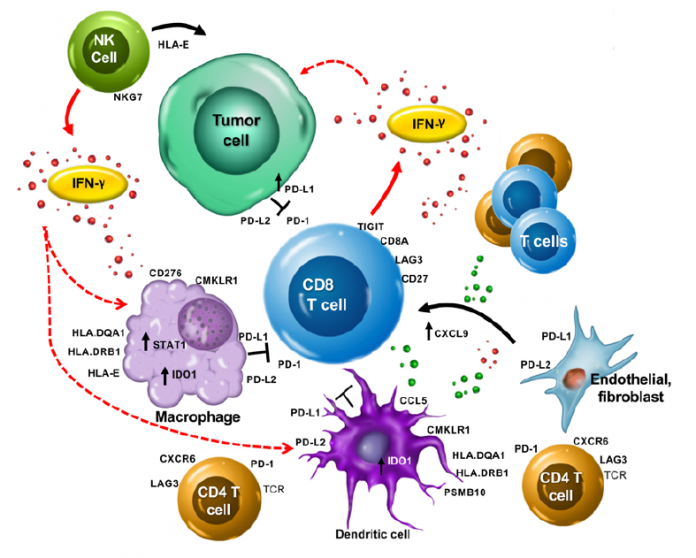 MacroGenics has cited preclinical results showing MGD013 provided enhanced T-cell activation compared to single or combination monoclonal antibody blockade. On October 15, NanoString said it entered into a $100 million term loan facility with CR Group (CRG), a healthcare-focused investment firm. Terms included an initial $60 million draw to refinance the company’s existing CRG term loan facility, under which approximately $50 million is currently outstanding, for working capital and general corporate purposes, and for transaction-related fees and expenses. The new loan added approximately two and a half additional years until maturity, extending the loan facility through September 30, 2024.